Ideal for Layer 2 device monitoring, the D-View® SNMP Network Management System provides useful tools to allow users to effectively manage device configurations. D-View 5.1 SNMP Network Management System is a comprehensive standards-based management tool designed to centrally manage critical network characteristics such as availability, responsiveness, resilience and security in a consistent way. Flexible and versatile, this software accommodates a wide range of new D-Link and third-party devices, including wireless bridges and access points, multi-layer switches, remote routers, and multi-tenant broadband CO devices. D-View provides useful tools to allow you to effectively manage device configurations, fault tolerance, performance, security and accounting services. D-View is organized into a vendor-independent platform and user plug-in modules. The platform consists of five main components, namely the Alarm/Trap Manager, Discovery/Parsing, MIB utilities, Internet tools, and the User Account Manager. The user can manage non-D-Link SNMP devices without plug-in modules. D-View provides a MIB compiler for the user to compile MIB files from the vendor of the device into a system-recognized format, then loads it into a database. The compiler can communicate with the user’s network device to get the current values or to set new values for the MIB objects of the user’s interest. All MIBs are converted into a graphic tree view, which can use the MIB Browser to manage the device. MIB contents in the database generated by the MIB compiler are organized according to the Microsoft Access format. This enhances the integration of the user’s environment, while giving the user the options of editing the user’s database using D-View or the familiar Microsoft Access software. User account management can be used with devices like wireless broadband gateways and multi-tenant broadband switches to provide connection to paying customers. This accounting system can be incorporated into the customer’s equipment. A simple billing system offers services in connection with user account management. The features include assignment of account with personal authorization IP address for each client; generation of statements with different schedules for different groups of clients; detection of abnormal usage for clients; assignment of custom taxes to service charges; credit adjustment function to let the user insert credit records manually and give credit for wrong or misdialed works; late fee assessment function; real-time reporting for current client summary, credit limit status report, and payment report. D-View supports a modular architecture, which allows users to install a module for various network devices into the system. D-View allows users to analyze and to manage such device upon the module installation. In addition, the Module Wizard can be used to compile and store the MIB file into the database if the user does not possess the device module. D-View is also able to manage a network device through the MIB Browser. D-View supports many standard MIB utilities such as MIB II, 802.1D, 802.1p, 802.1Q, RMON group, OSPF, DVMRM, PIM, IPM, RIP1, and RIP2. 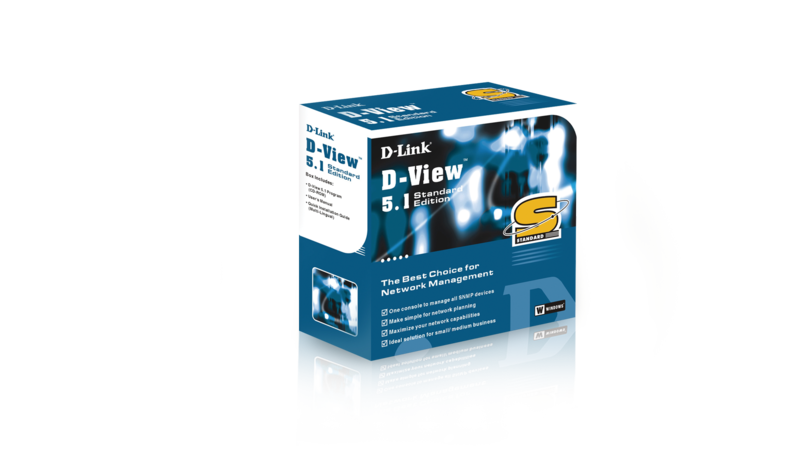 D-View 5.1 is an affordable but professional network management software. The user can easily use it to manage the corporate network routinely and use its advanced functions in Professional Version to do more complex and advanced management.